Teak Shower Bench Sale - Discount Prices + Free Shipping! Why Shop at My Teak Shower Bench? Sure you can find a small handful of teak shower benches at places like IKEA, Target and Bed Bath & Beyond but their selection is hardly impressive. My Teak Shower Benches, on the other hand, is an absolute teak bench super-store! Our catalog includes shower benches that attach to the shower - both corner units and traditional flat teak shower benches - as well as stand alone models that sit directly on the floor. 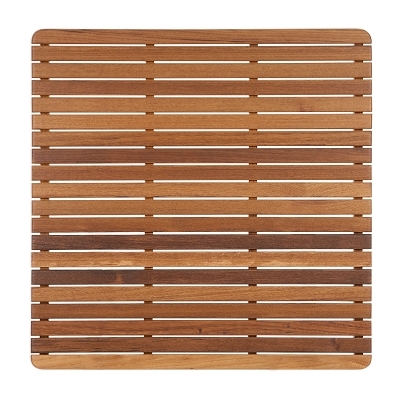 We even have a wide variety of teak shower accessories like floor mats, shelves, tables and stands. We compare the prices of our teak shower benches to that of our competitors daily to ensure that we're offering the absolute lowest prices anywhere. But when you purchase a shower bench with us, you have 30 days to find a lower price on the same teak bench from another retailer - and if you do, we'll refund 200% of the difference in price back to you! Click here for more details. While other shower bench retailers tack on a huge amount for shipping right at the end of the checkout process, we offer free shipping on every teak shower bench that we carry. The price you see on the product page is the price you'll pay... period. After you've placed your order, we'll typically get your bench or teak accessory shipped out & delivered within a week. We want to do everything we can to ensure a pleasant shopping experience for you. We know that privacy and security are important to that experience, which is why we use SSL encryption to protect your personal and financial information during the checkout process. (Note: If you're not comfortable placing your order online, you can place your order over the phone by calling (866) 813-6758.) We accept all major credit cards (even American Express) as well as PayPal. For us, teak shower benches aren't just an "afterthought" we've decided to add to our catalog to generate a few more sales. We love these beautiful benches! If you have any questions about a shower bench you have your eye on or need help finding the perfect one, please don't hesitate to call us at (866) 813-6758 or start up a live chat. We'll be more than happy to assist you. If the plastic or metal shower benches you find at most retail stores don't thrill you. we don't blame you. While they may hold up well to water, they are hardly classy looking pieces. Here, we offer a wide variety of teak shower benches for sale that not only look great, but because of the natural water propelling properties of teak, they'll look just as great for many years to come. 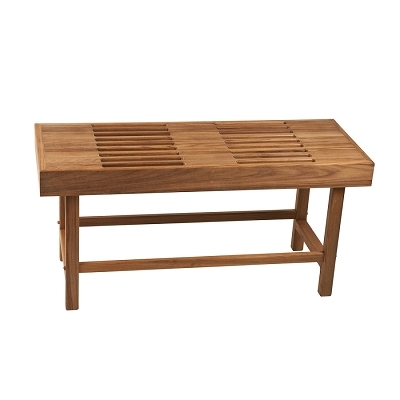 Teak wood benches are't just for the shower; many people use them outdoor on patios and pool decks. We've got rectangular benches and storage containers that are free standing or connect to a wall as well as corner teak shower stools and benches. Some have static legs or wall supports while others are folding teak shower benches that take up less room when unoccupied. Many of them are even ADA-compliant. 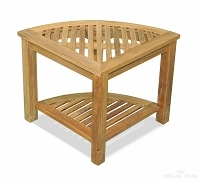 We've also got a wide range of beautiful teak floor mats, tables and shelves to choose from!